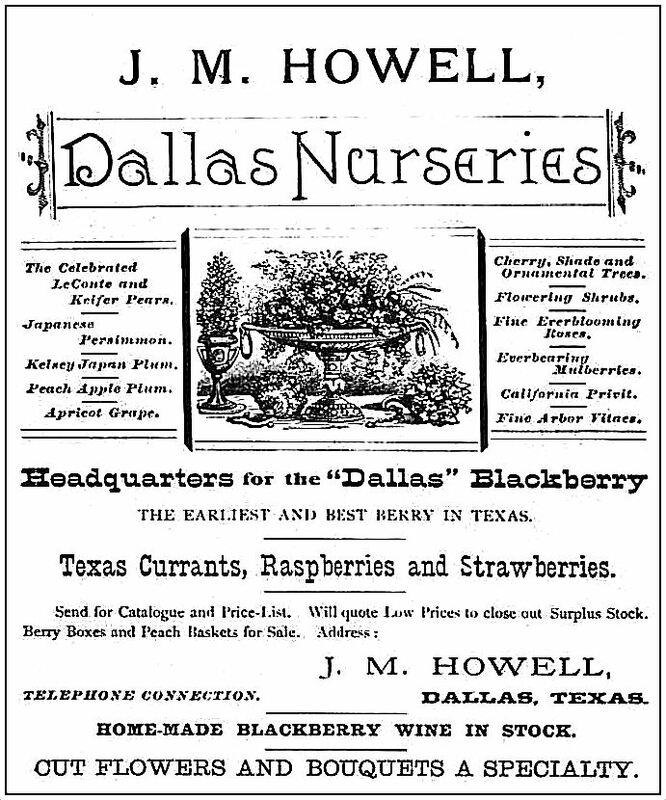 Dallas fruit grower and nurseryman J. M. Howell (1849-1925) was something of a “fruit visionary.” He gave us the “Dallas Blackberry” — something he was quite proud of. He also had dreams of giving Texans more shade. I am looking forward to the time when Forest and Shade Trees will be planted extensively in the cities and on the prairies of this State, consequently I am giving this class of stock special attention. Fruit and shade. I can get on board with that. He also issued some very pretty catalogs. Above images are from scans of Howell’s catalogs on the Internet Archive: the entire 1887-88 catalog is here; the 1888-89 catalog is here. 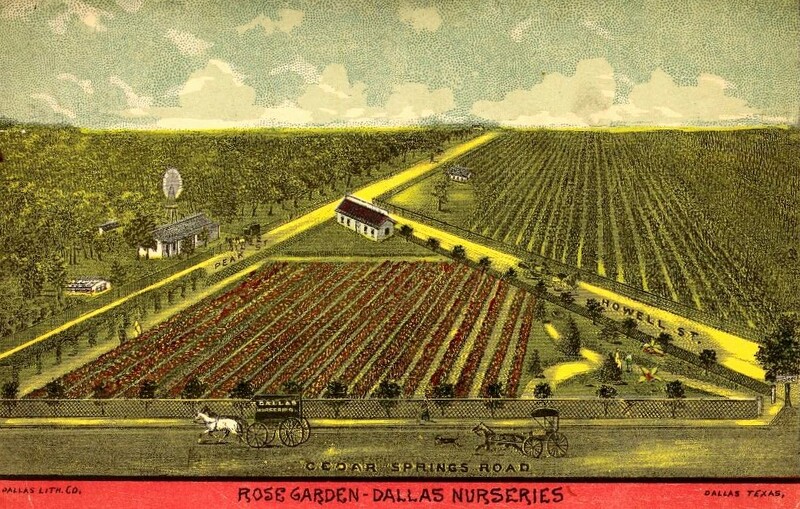 Included in these catalogs are descriptions of Howell’s inventory and his planting instructions to get the best yields from Dallas’ soil and climate. I LOVE the top image. This area — called “Howell’s Addition” — was at the northern edge of the city limits at the time. In March of 1891 the street name “Peak” was changed to “Fairmount” at Howell’s behest. In fact, Howell named the following streets: Fairmount, Maple, Routh (after his in-laws), and Howell. (His uncle was the namesake of nearby Thomas Avenue.) Below is a map showing the area around 1890 — there seems to be a lot of development around him. The rose gardens and orchards may be gone, but at least he got a street named after him. Map ca. 1891, confusingly rotated to show same view as top image. That triangular plot of land is still there (it was the location of the old Casa Dominguez restaurant for many years). Sadly, it’s not much of a scenic vista these days. Uptown could do with a few more orchards and a lot less of everything else. Howell was a guy who got around. Among other things, he is credited with introducing the magnolia tree to Dallas. Also, he was particular to peaches, and he planted acres and acres and acres of peach trees in Parker County, hoping they’d be a big cash-crop one day — and he was right! For more on Howell, see the Dallas Morning News article “Nurseryman Named Routh Street,” a great “Dallas Yesterday” profile by the always informative Sam Acheson (DMN, Dec. 14, 1970). Click color illustrations for larger images. Not much to write home about these days, huh? I spent a good part of my childhood driving past that triangle — my father’s bookstore was one block from there when the store was on Cedar Springs, and then, later, right around the corner on Maple. I see that triangle and I immediately think of Casa Dominguez. My husband of the Routh pioneers part of Routh & Howell was very pleased to see this article, map and catalog art. Helped connect some dots 😊 I wonder who the artist was. Perhaps Julia Routh? Thanks, Paula! I’m not sure who the artist was, but I love that art. I hope your husband saw the link at the end of the post to the article about Howell by Sam Acheson. Thanks for commenting! The cover of the 1888/89 catalog is amazing. Check out that ornamental lettering: like some kind of early Art Nouveau, Dallas style.